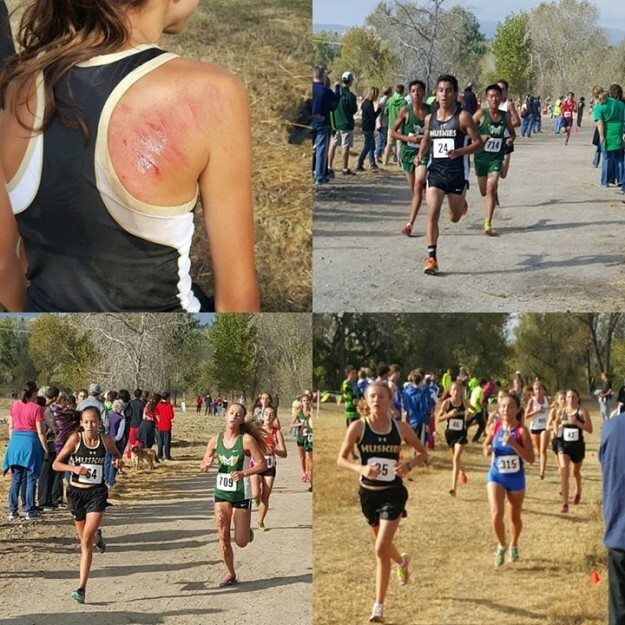 SEDALIA, Colo. — Battle Mountain Cross Country is fast, but this week they proved how tough they are too. It’s not often an injury report for a running team consists of concussions, road rash and bee attacks. “Then at [Saturday’s] meet three of the four races were called back after some pile ups at the start. Battle Mountain was involved in two of them,” Parish chuckled. The Husky ladies are currently ranked 2nd in 4A state, but knew going in they would have their work cut out for them as they faced perennial state title contender The Classical Academy and 5A powerhouse Mountain Vista. The Sabercat course narrows from 100 meters wide to 8 meters wide in the first 200 so a fast and chaotic start was expected. As the gun went off the Husky girls bolted from the start line and disaster struck. Sophomore Alex Raichart was tripped up by another team’s runner and went down hard. She took out teammate Lizzy Harding for good measure and luckily the meet official saw the carnage and fired the gun for a re- start. The 2nd start went off without a hitch and the Huskies were fired up. About half way through the race Raichart made a strong move and closed in on Mountain Vista’s #1 and 2 runners. The other 6 runners all moved up from mile 1 to 2 as well. Raichart led the charge in a break out race finishing 9th overall in a time if 19 minutes 36 seconds. “Stevens said we should have someone tackle her before every race,” said Parish. The Huskies had a strong pack following Raichart with all of the next 5 finishing in the top 25 at the race. Denardo crossed the finish line in 18th, Constien 1 second behind in 19th, Harding next in 22nd, Rossman in 23rd, and Hannah Gaylord in 24th. Just for good measure Delgado cracked the top 40 with a 37th place finish. For those not fluent in cross-country speak, the ‘one through five split’ is how much time passes between your 1st scorer and your last. The more time that passes, the more points you are likely to give up. While it was a stellar day, it wasn’t quite enough to knock off Mountain Vista. While the Husky girls are ranked #2 in 4A, the boys should not be overlooked. Ranked #3 they Huskies have had the strongest season since 2007 when that group was ranked #1 for most of the fall and went on to win a state title. Saturday the boys ran like one of the top teams in the state. As in the girls race there was some craziness at the start. If there was any doubt that girls are better listeners than boys, you needed only to watch as half the race ran 400 meters. Somebody was tripped up in the first 100 meters, but when the official fired a second shot from the gun the lead bike and the entire front half of the race kept running. The Husky boys were able to collect themselves as well as the girls and the second start went off without incident. Aguirre finished 5th place overall (16:28) and Pence was just a minute back in 24th. Franklin Reilly had a breakout race nearly catching Pence running at 17:28 to Pence’s 17:21. Koby Simonton rounded out the scoring with a 49th place finish (17:56) while Nate Badger and James Moran ran 18:18 and 18:21 respectively. That capped off an impressive finish against a tough field. Battle Mountain was the top 4A team in the race, although it is worth mentioning that Palmer Ridge and TCA did not run their full varsity squads. Battle Mountain will be back in action Friday in Delta with their first chance of the season to preview the Regional course.